An assortment of one hundred Flute Pads, available in 2.5 thickness. This assortment contains all commonly used Flute pads, with more of the most common sizes. An assortment of one hundred Flute Pads, available in 2.5 thickness. This assortment contains all commonly used Flute pads, with more of the most common sizes. 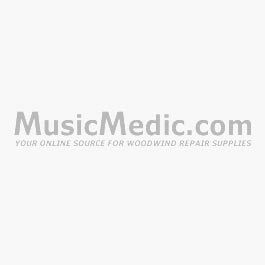 The Premiere 2.5mm Pressed Flute Pads are MusicMedic.com's first professional offering for flutes. These yellow double skin pads are made with our super premium Deep-Weave pressed felt. We developed this special felt with a European manufacturer with the resulting felt containing fibers that are woven together deeper than other premium felts and to our exact specifications. Our Premiere pressed felt pads will take an impression, yet also spring back after impact against the tone hole. These pads are highly stable, extremely flat, and have just the right amount of firmness for most professional players. As with all of our premium pads, their successful installation relies on a foundation of good repair work and flat tone holes.